In November 1956, D. S. Saund, who everyone simply called “Judge,” became the first person of Asian descent elected to serve as a United States Representative. He was a tireless champion of his southern California district and the farmers who called it home. But his unique backstory—born in India, naturalized U.S. citizen, successful businessman, county judge—also catapulted him to the international stage. 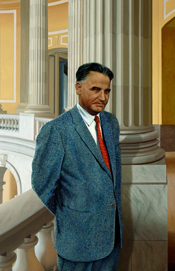 During his career in the House of Representatives, at the height of the Cold War, Saund became something of a transcendent politician who had the singular ability to engage audiences abroad. Although he frequently confronted discrimination during his life in the United States, Saund maintained his belief in the promises of American democracy. Berkeley, California, was not the most welcoming of places for Indian and Asian students, and “outside of the university atmosphere,” he later remembered, “it was made quite evident that people from Asia—Japanese, Chinese, and Hindus—were not wanted.”9 Saund, however, became involved with the local community and then earned MA and PhD degrees in mathematics in 1924. 1D. S. Saund, Congressman from India (1960; repr., Amritsar, India: Satvic Books, 2002): 12–15, 20. 2Saund, Congressman from India: 28. 7Ibid., 33–35, quotation on p. 35; New York Passenger Lists, 1820–1957, Arrival New York, New York, microfilm T715 1897–1957, roll no. 2842, p. 31, National Archives and Records Administration, Washington, DC, http://www.ancestrylibrary.com/ (accessed 30 October 2015). 8Saund, Congressman from India: 42. 10Quotation from Joseph Laitin, “Mr. Saund Goes to Washington,” Coronet reprinted in the Congressional Record, House, 85th Cong., 1st sess. (17 April 1957): 5940; Saund, Congressman from India: 44, 47–48. 11Saund, Congressman from India: 45 ; Gladwin Hill, “Colorful Contest Shaping on Coast,” 27 December 1955, New York Times: 17. 12Saund, Congressman from India: 46–47. 16Saund, Congressman from India: 63–64. 18“Mrs. Odlum, Saund Wage Hot Race,” 14 October 1956, Washington Post: A12; “First India Native Goes to Congress,” 11 November 1956, Atlanta Journal and Constitution: A9. 19Saund, Congressman from India: 55. 23Ibid., 71–74; “Indian Bill Praised,” 29 June 1946, New York Times: 3. 24Saund, Congressman from India: 75. 32Bill Becker, “Coast Race Finds Democrat Ahead,” 16 October 1960, New York Times: 48. 33Saund, Congressman from India: 91–92. 35Saund, Congressman from India: 94–95. 37Hill, “Colorful Contest Shaping on Coast.” See also Gladwin Hill, “Republicans Lose California Seats,” 8 November 1956, New York Times: 42. 38For population figures, see Congressional Directory, 85th Cong., 1st sess. (Washington, DC: Government Printing Office, 1957): 18; Congressional Directory, 88th Cong., 1st sess. (Washington, DC: Government Printing Office, 1963): 22. 39Saund, Congressman from India: 96–97; “The Southland: Hearing Set on Eligibility of Candidate,” 18 April 1956, Los Angeles Times: 22; “Appellate Court Refuses to Act in Election Case,” 27 April 1956, Los Angeles Times: 31. 40Saund, Congressman from India: 97. 43Erik Thomas Robinson, “Jacqueline Cochran,” in American National Biography, vol. 5 (New York: Oxford University Press, 1999): 117–118. 46Saund, Congressman from India: 99. 48Richard Dyer MacCann, “California Family Shares in Victory of India-Born Contestant for House,” 21 November 1956, Christian Science Monitor: 10. 49Congressional Record, House, 85th Cong., 1st sess. (14 June 1957): 9197. 51Saund, Congressman from India: 105–106; Richard Dyer MacCann, “Democracy Seen in Action,” 16 May 1956, Christian Science Monitor: 3. 52Gladwin Hill, “California Leans Strongly to G.O.P.,” 21 October 1956, New York Times: 1. 53Jacqueline Cochran, interview by Joe B. Frantz, 7 April 1974, transcript 1, Lyndon Baines Johnson Library, Oral History Collection, Austin, TX, https://www.eisenhower.archives.gov/research/oral_histories/c.html (accessed 11 April 2016). 54Saund, Congressman from India: 103–104; Hill, “Colorful Contest Shaping on Coast”; Eileen Summers, “Candidate Cochran Sees Agriculture As Top Issue,” 7 June 1956, Washington Post: 33. 55“A Sikh in Congress: Dalip Singh Saund,” 10 November 1956, New York Times: 13. 56Saund, Congressman from India: 104–105. 59“Upset Victor,” 8 November 1956, Chicago Daily Tribune: 11; Richard Dyer MacCann, “California Sends Ex-Asian to House,” 8 November 1956, Christian Science Monitor: 3; Laitin, “Mr. Saund Goes to Washington.” Saund’s stance toward agricultural subsidies was something of a region-wide trend, and the strength of farmers in the West “did much to offset the pull of President Eisenhower’s coattails” in the congressional races. See John D. Morris, “Farmers Helped House Democrats,” 8 November 1956, New York Times: 31. 60Martis, Historical Atlas of Political Parties in the United States Congress, 1789–1989: 195–211; “India Immigrant Wins California Seat,” 8 November 1956, Washington Post: A17. 61“East Is West,” 10 November 1956, Washington Post: A8. Not all the press coverage was so welcoming or tolerant. The Chicago Daily Tribune, who described Saund as a “detribalized Sikh,” recommended that Saund “revert to the costume and customs of his former country. . . . If he lets his beard grow and oils it until it shines, and puts his hair up under a bright red turban, he can expect to be a marked man in the house [sic].” See “Advice to the Sikh Congressman,” 14 November 1956, Chicago Daily Tribune: 16. 63“Rep. Saund Faces Fight for Congress,” 2 November 1958, Los Angeles Times: B2. 64Bill Becker, “Coast Race Finds Democrat Ahead,” 16 October 1960, New York Times: 48. 66Richard Dyer MacCann, “California Family Shares in Victory of India-Born Contestant for House,” 21 November 1956, Christian Science Monitor: 10. 67Don Shannon, “Californians Seek Place on House Rules Group,” 3 January 1957, Los Angeles Times: 18. 68“Nehru Meets India-Born Congressman,” 19 December 1956, Los Angeles Times: 18. For more information on his staff, see Saund, Congressman from India: 109–112. 70“Freshman in Spotlight,” 4 January 1957, New York Times: 14; Saund, Congressman from India: 115–116, 122; Congressional Record, House, 85th Cong., 2nd sess. (23 August 1958): 19922. 71Congressional Record, House, 85th Cong., 2nd sess. (23 August 1958): 19922–19923. For additional constituent services, see Saund, Congressman from India: 116–122. 72Congressional Record, House, 85th Cong., 1st sess. (14 June 1957): 9197. 73“Congressman-Elect to Visit Native India,” 9 November 1956, Los Angeles Times: 22. See also “Rep. Saund to Tell His Story to India,” 9 November 1956, Washington Post: C4; “Winner on Coast Plans India Trip,” 10 November 1956, New York Times: 13. 76Saund, Congressman from India: 151. 77“Congressman Born in India to Visit There,” 3 May 1957, Los Angeles Times: 7. See also “Saund Visits Japan,” 31 October 1957, New York Times: 8 ; “Saund Manila Bound,” 18 November 1957, Los Angeles Times: 5; “The Price of Indonesian Favor,” 19 November 1970, Los Angeles Times: B4. 78Quotation from “Rep. Saund Sells U.S. on His Tour,” 18 December 1957, New York Times: 19. See also “Saund in Indian Homeland,” 26 November 1957, New York Times: 13; “U.S. Should Sell Itself to Asians, Says Saund,” 23 December 1957, Los Angeles Times: 6. 79Josephine Ripley, “A Congressman With a Mission,” 8 February 1958, Christian Science Monitor: 20. 80Earl W. Foell, “U.S. Urged to Clarify Motives in Asia,” 7 January 1958, Christian Science Monitor: 14. 81Congressional Record, House, 85th Cong., 2nd sess. (23 August 1958): 19923. For more on Saund’s trip abroad, see Saund, Congressman from India: 148–179. 82Saund, Congressman from India: 127. 83Congressional Record, House, 86th Cong., 2nd sess. (1 September 1960): 19359; Congressional Record, House, 86th Cong., 2nd sess. (22 August 1960): 17086. 84Congressional Record, House, 86th Cong., 1st sess. (17 August 1959): 16066–16067; Congressional Record, House, 86th Cong., 2nd sess. (1 September 1960): 19359; House Committee on Interior and Insular Affairs, Providing for the Equalization of Allotments on the Agua Caliente (Palm Springs) Reservation in California, 86th Cong., 1st sess., H. Rept. 903 (14 August 1959); Unpublished hearing before the House Committee on Interior and Insular Affairs, Subcommittee on Indian Affairs, To Authorize Longer Term Leases on Indian Lands on the Agua Caliente (Palm Springs) Reservation, 7 August 1959; House Committee on Interior and Insular Affairs, Authorizing Longer Term Leases of Indian Lands on the Agua Caliente (Palm Springs) Reservation, 86th Cong., 1st sess., H. Rept. 901 (14 August 1959). 85Congressional Record, House, 86th sess., 2nd sess. (1 September 1960): 19359–19360. On the Bracero program, see also Bill Becker, “Coast Race Finds Democrat Ahead”; Congressional Record, House, 86th Cong., 2nd sess. (24 August 1960): 17546–17547. 86Congressional Record, House, 86th Cong., 2nd sess. (1 September 1960): 19361; Congressional Record, House, 86th Cong., 1st sess. (9 June 1959): 10341; Congressional Record, House, 86th Cong., 1st sess. (17 August 1959): 16080–16083. See also Saund, Congressman from India: 181–184. 87Saund, Congressman from India: 187. 88Congressional Record, House, 87th Cong., 1st sess. (16 August 1961): 16060. 89Ibid., 16061. See also Congressional Record, House, 87th Cong., 1st sess. (17 August 1961): 16211–16212; Don Shannon and John H. Averill, “Saund Could be Target of Purge in 1962,” 27 August 1961, Los Angeles Times: B3. 90D. S. Saund, Report of the First Meeting of the Mexico-United States Interparliamentary Group, 87th Cong., 1st sess., H. Rept. 197 (24 March 1961): iii. 91Saund, Report of the First Meeting of the Mexico-United States Interparliamentary Group: 1. 94Richard Bergholz, “The Position of Saund is Puzzle to Election,” 23 July 1962, Los Angeles Times: A4; John H. Averill, “Democrats Worry Over Saund Illness Secrecy,” 17 June 1962, Los Angeles Times: A4; John H. Averill, “Rep. Saund Will Run Again Despite Illness,” 7 September 1962, Los Angeles Times: 2; “Rep. Saund of California Campaigns from Hospital,” 8 September 1962, Los Angeles Times: 16; “Opinions on Health of Rep. Saund Conflict,” 17 October 1962, Los Angeles Times: 20; “Saund: Mystery Veils His Illness in Capital,” 21 October 1962, Los Angeles Times: K5; “Rep. Saund Sure He Can Serve, But Leaves Decision to Doctors,” 30 October 1962, New York Times: 12. 96“Saund Moved to San Diego Naval Hospital,” 30 November 1962, Los Angeles Times: 33; “Saund in UCLA Center,” 14 January 1963, Los Angeles Times: 26; “Ex-Rep. Saund Shows Slow but Good Progress,” 10 May 1963, Los Angeles Times: 24. 97“Dalip Saund Dies; Ex-Legislator, 73,” 24 April 1973, New York Times: 44; “Dalip Saund, 73: Former Congressman,” 24 April 1973, Los Angeles Times: E18; “Ex-Rep. Dalip S. Saund, First Native of India to Hold U.S. Elective Office,” 25 April 1973, Washington Post: C11. 98Congressional Record, House, 93rd Cong., 1st sess. (15 May 1973): 15756, 15757, 15759. "Dalip Singh (Judge) Saund" in Asian and Pacific Islander Americans in Congress, 1900-2017. Prepared under the direction of the Committee on House Administration by the Office of the Historian and the Office of the Clerk, U.S. House of Representatives. Washington: Government Publishing Office, 2018.